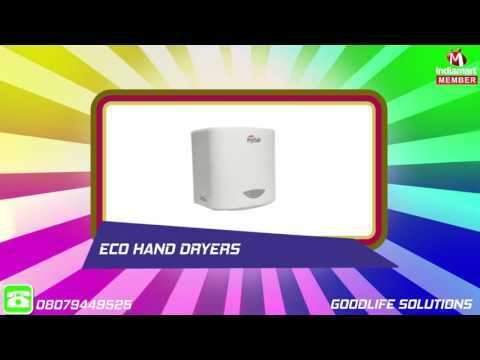 Goodlife Solutions is the company that is engaged in the manufacturing a huge assortment of Air Curtains, PVC Strip Curtains, Fly Catchers, Hand Dryers, Soap Dispensers, Foam Soap Dispensers, Paper Napkin Dispensers, Toilet Roll Dispensers, Shoe Shining Machines, Aerosol Dispensers, Wringer Buckets, Garbage Trolleys, Stainless Steel Dust Bins, Animated Dust Bins and many more. We are known in the industry for providing hygiene equipment and consumables to the patrons. Our company has started its journey in the year 2011 at Secunderabad in Telangana, India. Our management has got rich industrial experience of over thirty years in the field of hygiene care, GMP and clean room concepts. Due to this experience and vast industrial knowledge in the same field enable us to provide best quality products. Also, we look after the needs and requirements of our clients that help us to attain their maximum satisfaction. That%u2019s why we keep diverse demands of the customers while providing and producing goods to our customers. We manufacture these products under the own brand name Mystair, Airodyne and more.